Toronto Brigantine Incorporated (TBI) has been operating on the Toronto waterfront for more than 50 years. An explanation of this organization cannot be better put than this quote from the Toronto Brigantine website. "Toronto Brigantine, a charitable organization, began in 1962. Our founding tenets were the development of leadership, discipline, and citizenship in a maritime environment. The men and women who founded Toronto Brigantine believed that exposure to the challenge of the sea-going lifestyle could benefit young people. 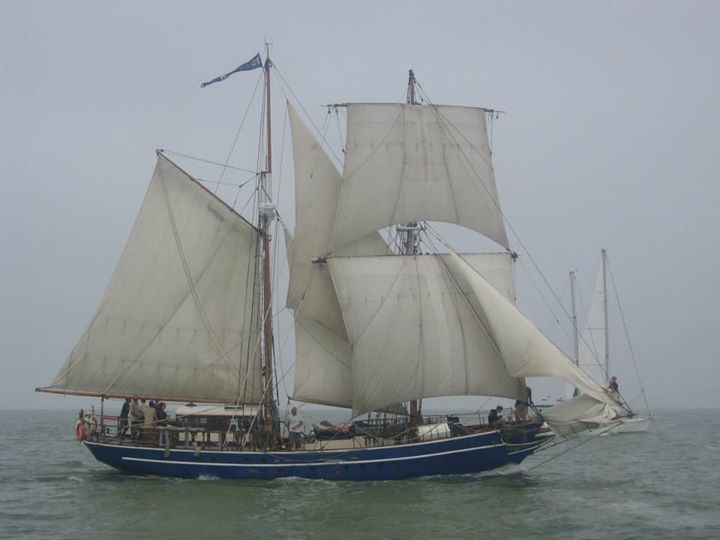 Our original vessel, Pathfinder, was commissioned in 1964 and Playfair joined the organization in 1973. From the beginning, ‘building character through adventure’ has been the primary objective of TBI. Since Toronto Brigantine began, thousands of young people have participated in our character­ building programs. By working together, sailing, and managing our square-rigged ships, these young people have discovered important lessons about life. More importantly, they’ve discovered themselves. They have learned how satisfying and fun it is to contribute. Our purpose is the provision of an environment, aboard ship and in the Winter Program that fosters and rewards self-confidence, teamwork, responsibility, custodianship and leadership in youth." 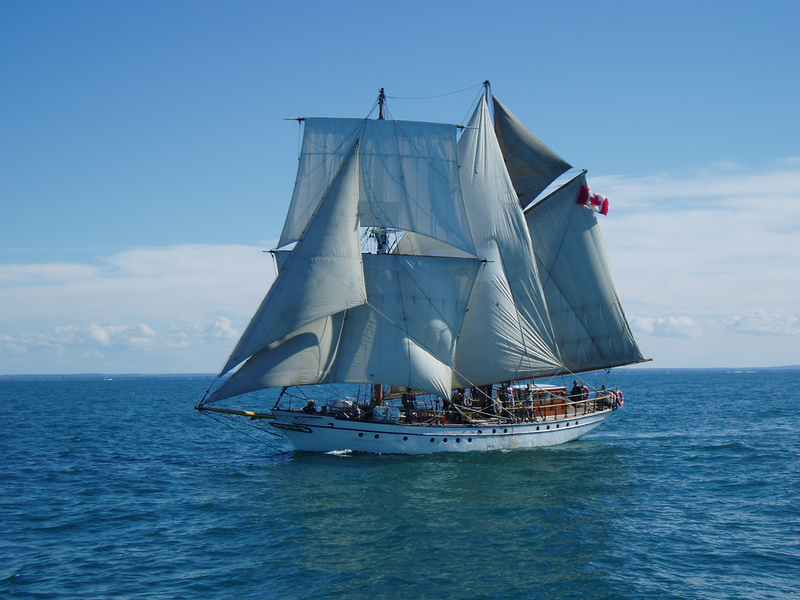 More information on Toronto Brigantine can be found at their website here. You can contact them directly by telephone at 416-596-7117 or by email at office@torontobrigantine.org. Many years ago, I was fortunate to have sailed on the original brigantine, St. Lawrence II, out of Kingston, Ontario. I also sailed on Pathfinder in the early days of Toronto Brigantine Incorporated. At some point, a decade or more ago, I aquired an old bumper from TBI. These are made to take a tremendous amount of abuse and are not like the plastic air-filled ones that are used for pleasure boating. When a forty to fifty ton ship comes hard against the pier the bumper on the right will do the job. 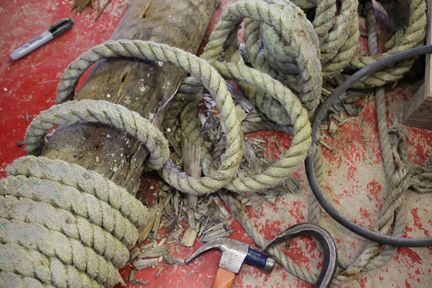 These bumpers are made by winding a piece of heavy rope around a timber and securing it with a nail on every pass. By the time I had removed all of the rope, most of the wood lay in pieces. I considered a number of possibilities to reconstruct the timber into a usable form. 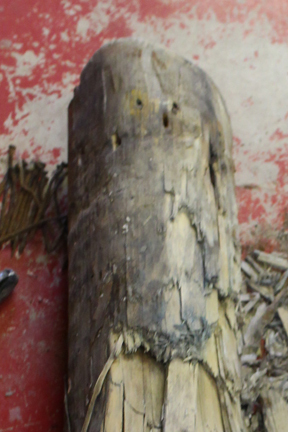 One idea was to hold the wood together as best as possible and soak the entire piece with a diluted epoxy. While this might have been the best solution, the amount of epoxy required would have made the turning expensive. 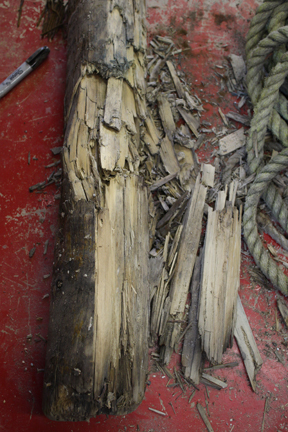 The wood inside the rope coil initially holds the line but ultimately it is the rope holding the wood. Each time the bumper does its job the wood fragments a little more. In this video, taken when the rope was removed from the wood, I review the dilemma. At this point, abandoning the project is a serious consideration. However, I was determined not to be defeated by what was either kindling or compost! The upper end was found to be, relatively, more solid than the rest of the piece. (This is not saying much though!) I was able to make two small boards from it. There appeared to be some minor cracks in the wood so I filled these with clear epoxy. I took the unusual step of gluing up all the rings at the same time and using epoxy to do it. 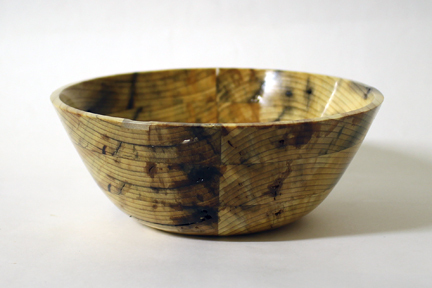 The bowl did not come together as tightly as I would have liked but at least I had what looked like a bowl. Before putting the piece back on the lathe I had to make sure, once and for all, that I had found and secured all the cracks in the wood. This called for some fancy epoxying. I explain what I did in the video on the right. I decided to call the piece "A Brigantine's Welly?". This came from an email I had re﻿ceived from ﻿﻿Kezia Weed, Program Coordinator at Toronto Brigantine Inc. Here is what she said that intrigued me: "﻿ I was so surprised to see one of our wellys turn into such a beautiful piece!" Now there was a term I had never heard before! Wellys! I have an extensive background in sailing and boating. I wrote Kezia and asked her where wellys came from. This was in early June and, of course, she was very busy with the summer program and didn't get a chance to respond. I thought that I had better do some research into the term. I now know more synonyms and uses for boat bumpers than I ever thought possible. However, the term wellys never showed up. Then, just a few weeks before the show was to open, I received an email from Kezia and I was enlightened. Here is her reply to my question: "We call them Wellys because they are predominantly used while we are heading up or down the Welland Canal. Due to their large size and sturdiness (except when rotten!) 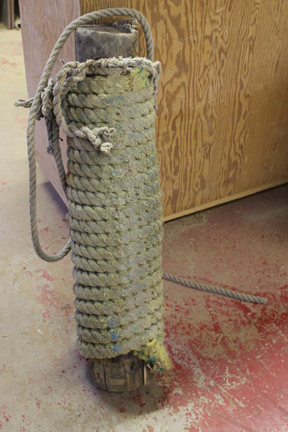 they protect the ships much better than typical rubber fenders."